Spring break has finally arrived. I am having a hard time with calling it "spring" break, however. It's a winter break, if you ask me. After all, it's still February. It was 15 degrees this morning as I drove to Carmichaels to do my community service project with Val. The slush, salt and a road treatment that looked like grated coal left my poor Jeep assaulted and nasty. It used to be silver; it is now a very dull and unhappy dark gray. It deserves a good run through one of those nifty drive-thru car washes (hey, if you see me in the back yard with a garden hose and soap bucket in February, you'll know Hades has officially frozen over…). Despite the fact that winter's folly continues, I have this "spring" break, and boy, do I need it. I pulled a 12-hour shift at the hospital on Monday, took (and passed!) a pharmacology ATI exam on Tuesday, had a parent-teacher conference on Tuesday night, had class all day Wednesday, and I just got back from the aforementioned community service project. For the next 11 days, there are no deadlines, no exams, no rapid responses on the oncology unit. 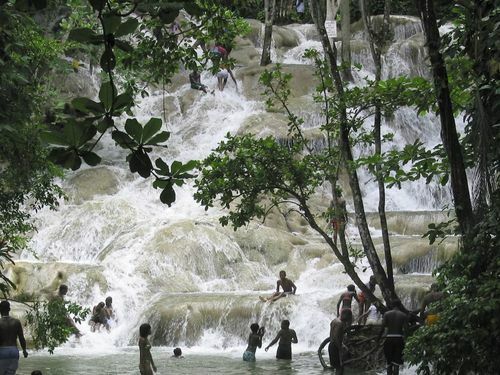 Dunns River Falls, Jamaica…. See you again soon!